Crab spiders that hunt in flowers prey on pollinating insects. Thus, pollinating insects tend to avoid flowers that harbor crab spiders. We established this in part one. Now we ask, what effect, if any, does this interaction have on a crab spider infested plant’s ability to reproduce? More importantly, what are the evolutionary implications of this relationship? But missing from this discussion is the fact that crab spiders don’t only eat pollinators. 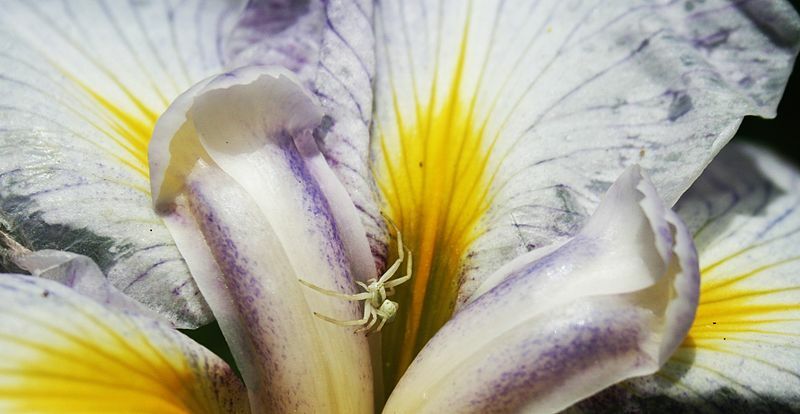 Any flower visiting insect may become a crab spider’s prey, and that includes florivores. 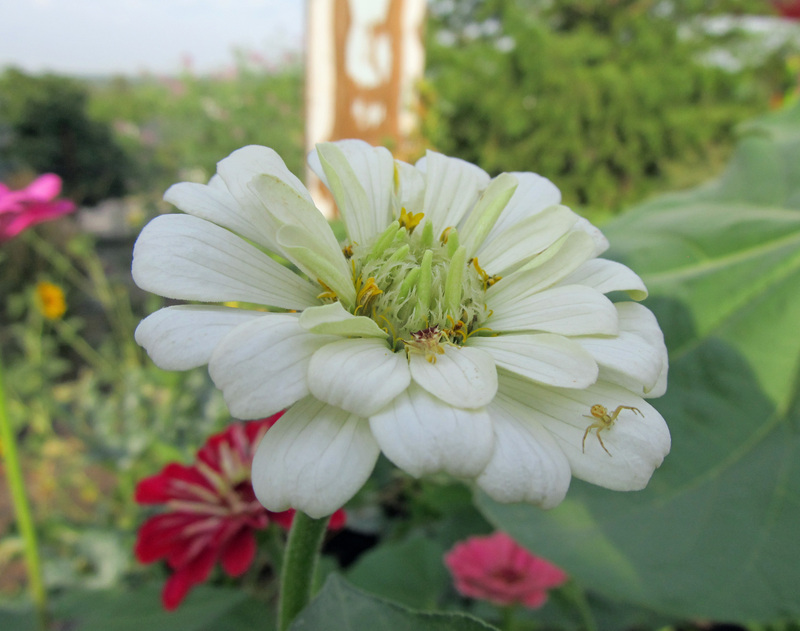 In which case, crab spiders can benefit a plant, saving it from reproduction losses by eating insects that eat flowers. In April of this year, Nature Communications published a study by Knauer, et al. that examined the trade-off that occurs when crab spiders are preying on both pollinators and florivores. 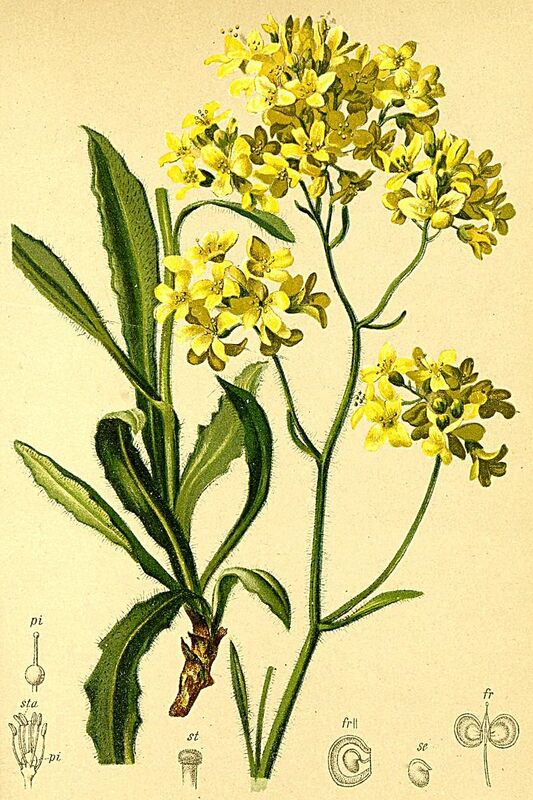 Four populations of buckler-mustard (Biscutella laevigata ssp. laevigata) were selected for this study. Bees are buckler-mustard’s main pollinator, and in concurrence with other studies, they significantly avoided flowers when crab spiders were present. Knauer, et al. also determined that bees and crab spiders are attracted to the same floral scent compound, β-ocimene. This compound not only attracts pollinators, but is also emitted when plants experience herbivory, possibly to attract predators to come and prey on whatever is eating them. But none of these studies are one size fits all. Predator-pollinator-plant interactions are still not well understood, and there is much to learn through future research. A meta-analysis published in the Journal of Animal Ecology in 2011 looked at the research that had been done up to that point. Included were a range of studies involving sit-and-wait predators (like crab spiders and lizards) as well as active hunters (like birds and ants) and the effects of predation on both pollinators and plant-eating insects. They concluded that where carnivores “disrupted plant-pollinator interactions, plant fitness was reduced by 17%,” but thanks to predation of herbivores, carnivores helped increase plant fitness by 51%. This suggests that carnivores, overall, have a net positive effect on plant fitness. In other words, while we still have a lot to learn, the impact these tiny but skillful hunters have should not be underestimated. When a bee approaches a flower, it is essentially approaching the watering hole. It comes in search of food in the form of pollen and nectar. As is this case with other animals who come to feed at the watering hole, a flower-visiting bee makes itself vulnerable to a variety of predators. Carnivores, like the crab spider, lie in wait to attack. The flowers of many plants rely on visits from bees and other organisms to assist in transferring pollen from stamens to stigmas, which initiates reproduction; and bees and other flower visitors need floral resources to survive. Crab spiders exploit this otherwise friendly relationship and, in doing so, can leave lasting impacts on both the bees and the flowers they visit. Species in the family Thomisidae are commonly referred to as crab spiders, a name that comes from their resemblance to crabs. Crab spiders don’t build webs to catch prey; instead they either actively hunt for prey or sit and wait for potential prey to happen by, earning them the name ambush predators. Of the hundreds of species in this family, not all of them hunt for prey in flowers; those that do – species in the genera Misumena and Thomisus, for example – are often called flower crab spiders. Most crab spiders are tiny – mere millimeters in size – and they have a number of strategies (depending on the species) to obscure their presence from potential prey. 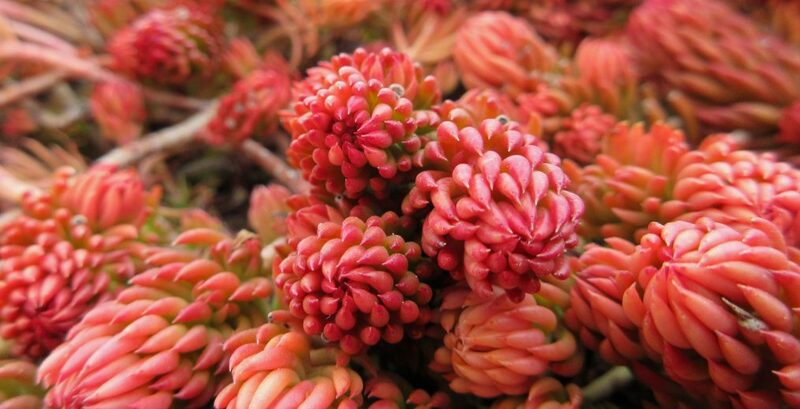 They can camouflage themselves by choosing to hunt in a flower that is the same color as they are or, in the case of some species, they can change their color to match the flower they are on. Some species of crab spiders reflect UV light, which bees can see. In doing so, they make themselves look like part of the flower. Needless to say, crab spiders are crafty. So the question is, when killing machines like crab spiders are picking off a plant’s pollinators, does this affect its ability to reproduce? First let’s consider how pollinators react to finding crab spiders hiding in the flowers they hope to visit. A study published in Oikos in 2003 observed patches of common milkweed (Asclepias syriaca) – one set was free of crab spiders, the other set was not – and tracked the visitations of four species of bees – the common honey bee and three species of bumble bees. They compared visitation rates between both sets of milkweed patches and found that the smallest of the three bumble bee species decreased its frequency of visitation to the crab spider infested milkweeds. Honey bees also appeared to visit the infested milkweeds less, but the results were not statistically significant. The two larger species of bumble bees continued to forage at the same rate despite the presence of crab spiders. During the study, crab spiders were seen attacking bees numerous times. 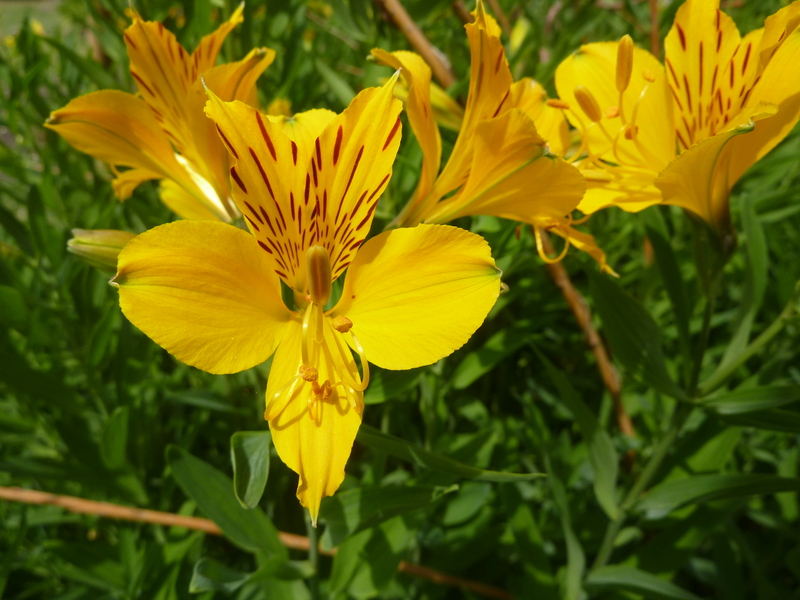 Six attacks resulted in successful kills, and of the bees that escaped, 80% left the flower and either moved to a different flower on the same plant, moved to a different plant, or left the patch altogether. These results indicate a potential for the presence of crab spiders to effect plant-pollinator interactions, whether its directly (predation) or indirectly (bees avoiding flowers with crab spiders). Another study published in Behavioral Ecology in 2006 looked at two species of bees – the honey bee and a species of long-horned bee – and their reactions to the presence of crab spiders on the flowers of three different plant species – lavender (Lavandula stoechas), crimson spot rockrose (Cistus ladanifer), and sage-leaf rockrose (Cistus salvifolius). 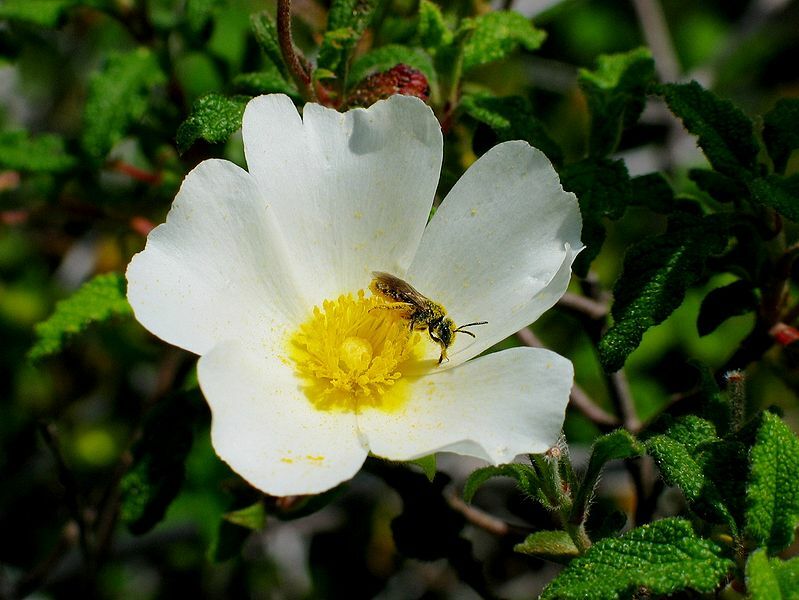 Honey bees were about half as likely to select inflorescences of lavender when crab spiders were present, and they avoided the crab spider infested flowers of crimson spot rockrose with a similar frequency. On the other hand, the long-horned bee visited the flowers of crimson spot rockrose to the same degree whether or not a crab spider was present. 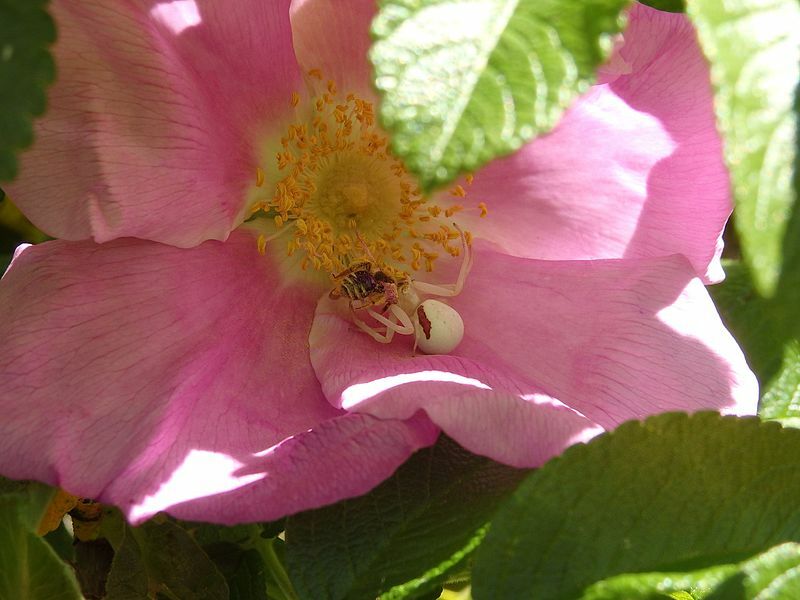 The researchers then exposed honey bees to the flowers of sage-leaf rockrose that were at the time spider-free but showed signs that crab spiders had recently visited. Some of the flowers featured the scent of crab spiders, others had spider silk attached to them, and others had the corpses of dead bees on them. They found that even when crab spiders were no longer present, the bees could still detect them. Honey bees were particularly deterred by the presence of corpses. The long-horned bees were also exposed to the flowers with corpses on them but didn’t show a significant avoidance of them. So, again, if bees are avoiding flowers due to the presence of predators like crab spiders, what effect, if any, is this having on the plants? We will address this question in part two.